Hey, The Ghost Riders started in Concord, California with one man&apos;s idea. As you know, callers had been using records for a long, long, time. The reason was quite simple really, you see, they could practice anytime without calling a musician. Not only that, but they never had to worry about where they would take their cue. They&apos;d call a "do-cee-do" at the guitar solo and a "right hand star" at the moment the fiddle took off. that is because the record never changed, it was the same each and every time they would call a tip. Back in the old days, musicians didn&apos;t quite understand the sixteen measure concepts (and many still don&apos;t) and how to change a regular country western tune to something a caller could work with. In 1969 Mr. Hal Langer, a square dancer, was interested in square dancing to live bands, but he knew that every time he had a chance to, it was a disaster. Well after a lot of soul searching, Hal came up with the perfect idea of starting his own band! He understood that he couldn&apos;t use regular musicians so he thought, what about square dancers? Hey, that&apos;s the ticket, they know the calls, they understand square dancing and all he had to do was teach them how to play an instrument. No problem! All he had to do was teach some people that knew all about square dancing and nothing about playing music--- RIGHT! Sure, that&apos;s all. Well, that&apos;s just what he did. They formed a four-piece band and called it the "Ghost Town Echo." Hal played banjo and took the leadership role on for the band. Dorrie, Hal&apos;s sister played bass guitar, Jim Starr played guitar, and Kay played fiddle. There was no drummer but the banjo kept a pretty good rhythm. It worked real well and mostly had a bluegrass sound. A few months later, Dan Bright saw the band perform at a local hoedown and found himself hanging around the stage. Hal soon asked if Dan was a musician and then asked him if he would be interested in coming to a rehearsal. Dan did, and soon joined the band. Kay dropped out but Hal&apos;s wife, Nancy, returned home from college and became the drummer. Soon after that Jim had to quit because of a work transfer and the band was back to 4 members. In 1972, Hal was moving to Mack, Colorado, to pursue his career in science. Hal called Dan and asked if he would like to keep the band going. After pondering it for awhile Dan asked how would that be possible? Hal said, same way I did, get square dancers, teach them to play, and have fun. Well, Dan did just that. The Ghost Riders Square-dance band was formed. 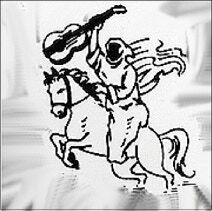 The logo (Ghost on the horse holding a guitar) was designed by Bert Swerer, a square dance caller. Before Hal Left, He impressed on Dan Bright, number one-- A Live Square Dance Band was the future, and number two-- The ghost logo had to be the focus instead of the band or any one person. Dan, like an Olympian runner picked up the torch and ran, and man did he! He found four square dancers. One was a drummer named John Moore. The next two dancers were a father and son team, which Dan taught to play guitar. Aron Schneider learned to keep a strong rhythm on his guitar while his son Rudy laid a strong foundation on bass. to round it all off, Dan found a dancer out of Martinez, Calif., Named Gary Spence whom he taught how to play piano. A Band was formed! And keeping with Hal&apos;s wishes, Dan called the Band ---The Ghost Riders---. The GHOST RIDERS had been together for approximately fifteen years when Mr. John Moore decided it was time to retire and lay down those sticks. Keeping with the Ghost Riders&apos; tradition they needed a person that was a square dancer. They brought in an old high school friend that had grown up with John and Rudy. On occasion he would sit in with the band. This would happen off and on throughout the years as a relief drummer for John in emergency situations. He was not only a dancer, but his family had a long line of square dance callers within it. It seemed only natural! His name is David L. Ciccone. Approximately a year later Aron Schneider, the Rhythm guitar player and band manger, had to retire from the band for health reasons. He now resides in Arizona. At this time his son took over as band manager. Rudy Schneider chose to retire about two years after that. He also resides in Arizona and is doing very well for him self as a bus driver for a prestigious charter company. In 2001, shortly after the Band&apos;s Mexican Riviera cruise, David Ciccone retired. He still lives close by and we see him from time to time. You may see his picture on a Christian CD soon. After 34 years with the Ghost Riders, Dan Bright passed away suddenly in March of 2006. This was a huge shock to the Ghost Riders as well as the entire square dance world. The remaining Members had a meeting and decided that the GHOST RIDERS MUST GO ON. We have picked up the torch and will carry it forward in memory of DANIAL T BRIGHT our brother. There have been many changes in the past, but one thing has not changed, and that is the man on the horse. Throughout the years people may not remember the old player&apos;s but they never forget the Ghost Rider, you know, the man on the horse! Brad Barnett : aka Tegner Zeering and &apos;new guy for life&apos; is proud to be sitting as newest keyboard player. Brad plays keyboard, sound modules, and mandolins and sings lead and background vocals. He and wife Janis also square dance with a local club.